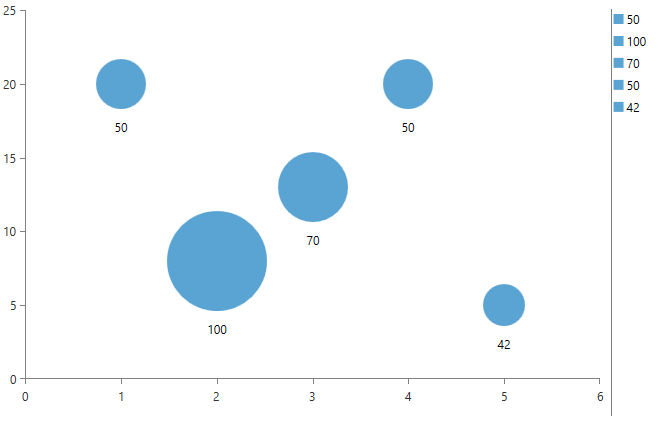 The scatter bubble series is used to visualize three dimensional data. 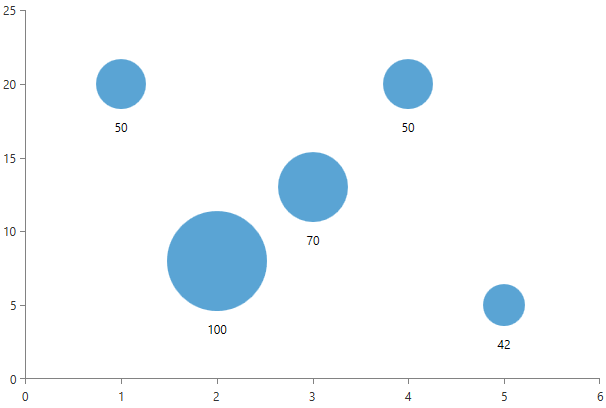 Each entity in the data set is represented by a bubble shape. Two of the data's dimensions determine the bubble's position and the third determines its size. You can use the XValueBinding, YValueBinding and the BubbleSizeBinding properties of the ScatterBubbleSeries to bind the DataPoints’ properties to the properties from your view models. DataPointLegendSettings - the series supports two types of legend settings, the first one is the common SeriesLegendSettings which can be used with all types of series and it maps each legend item to a series. The series supports an additional DataPointLegendSettings which maps the legend items per data point. PaletteMode – the ScatterBubbleSeries supports two modes that determine whether the applied palette should be applied per series or per data point. The mode can be controlled through the PalleteMode property. The modes are called Series and DataPoint. Hover interactivity – RadCartesianChart exposes a property called HoverMode. This property can be used only by the bubble and bar series. If it is set to “FadeOtherSeries”, when you mouse over a data point, the bubbles from all other series will fade out. The default value of the property is “None”. BubbleSizeSelector – this feature allows you to customize the size of each bubble. The ScatterBubbleSeries exposes a BubbleSizeSelector property that accepts a property of type ChartBubbleSizeSelector. The size of the bubbles is always determined by the BubbleSizeSelector. By default the series uses the AbsoluteBubbleSizeSelector which returns the BubbleSize value of the data point. There are two built-in size selectors – the AbsoluteBubbleSizeSelector and the RelativeBubbleSizeSelector. The absolute selector is simple and it always returns the BubbleSize value. If your business items contain the size in pixels, you can use the default selector. On the other hand the relative size selector is more complex and it takes into account several factors when calculating the bubble size. The selector chooses a size that is relative to the maximum value in the associated series and the maximum allowed size. The maximum size of a bubble depends on the size of the chart and the MaximumSizePercent property of the selector. By default the value of this property set to 0.2 and the maximum bubble size is 20% of the chart's size. You can adjust the RelativeBubbleSizeSelector by manually set its MinimumValue, MaximumValue, MinimumSize, MaximumSize. You can use the BubbleSizeFunction property to specify whether how the value should be mapped - with a linear function, square root function, logarithmic function or a cubic function. 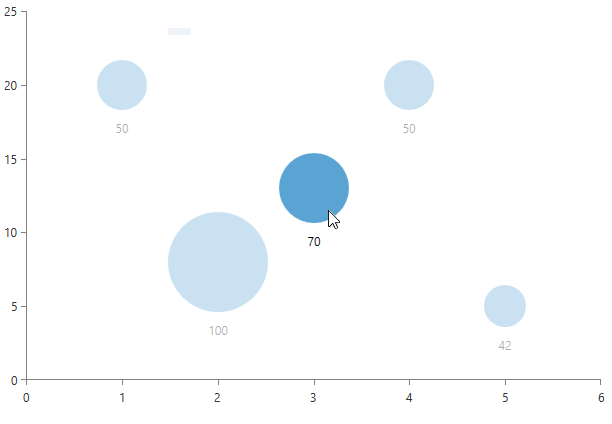 You can customize the BubbleSize of each DataPoint by creating a custom bubble size selector. 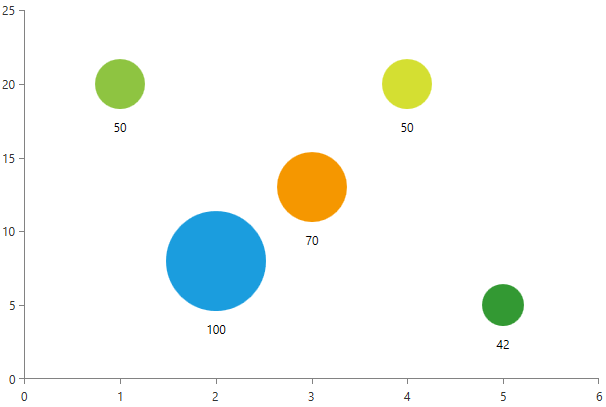 The selector should derive from the abstract ChartBubbleSizeSelector class which exposes a single abstract method called SelectBubbleSize. The method accepts an object of type IBubbleDataPoint and it return the size of the bubble. You can calculate the new size based on the information in the data point object.